Baby hampers and baskets are the perfect birth gifts. Bebedeparis offers a large selection of different hampers and baskets and the option of personalising them with accessories and outfits of your choice. All baskets and hampers are impeccably presented in traditional wicker baskets or exclusive vintage boxes. Delivery in 24-72 hours in South Africa depending on your location. Bathtime! Twins bathtime baby basket is the perfect birth gift for twins. Bathrobes, toiletry bags and a set with comb, brush, scissors and sponge for newborns. When happiness is doubled… Presenting our baskets for twins! Presented in an exclusive cable knitted box. 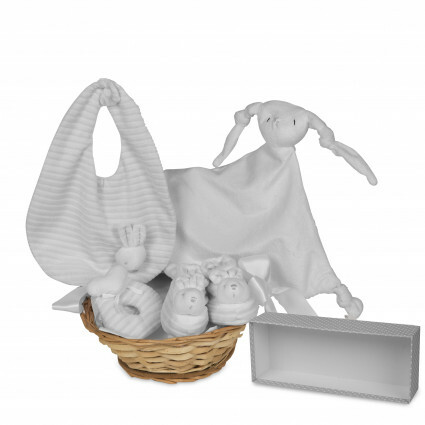 The hamper is an ideal gift for newborns, it includes all kinds of essential items for the baby. A gorgeous,personalised baby hamper is one of the best, all-round gifts you could give an expectant mother. They are loaded with all sorts of luxury baby goodies and with the option of personalising it, you will be giving them something that suits mums style and personality down to a tee! Classic Baby Hamper, your gift is sure to bring out those oohs and aahs from mum and guests alike. The items included in the baby gift basket vary, with some hampers including a cute set of cotton pyjamas, soft plush toy (teddies, elephants, rabbits, and other adorable toys are available), a baby grow, and unique bags for pacifiers, bottles and other much-needed baby items. If you are at a loss as to what to gift your expectant friend or family member, you really cannot go wrong when selecting any one of our stunning hampers. It is the ultimate, complete, all-in-one kind of gift that keeps on giving. None of the items included is perishable, allowing the mother to use the items for future babies or as a pass-along present. Our baby hampers are available in blue, pink or grey and we also have twin gift options for those mothers expecting more than one little blessing. For our South African clients, we have a selection of gift ideas for you to choose from. You have the option of the plain gift set which includes the clothing and helpful bags, the newborn gift set with the essential clothing, and the baby bath set which includes a bathrobe and essential bath time goodies. And then we have the more specific gift hampers. Our picnic baby gift hamper, complete tableware basket, dungaree gift set and embroidered hampers are all exceptional gifts to give. These unique gifts will strike the right cord and will be much appreciated and treasured each time they are used. Adding the personal touch makes the gift all the more special. If you can’t find something among our vast selection of gifts, or you have had a baby hamper idea that needs to be custom made, we are the people who can help! Our custom hamper option is easy to set up. Firstly, you’ll have to select the products from Bebe de Paris that you simply love. You then need to choose a wicker basket or a stylish vintage box for your gifts. Once you’ve made your selections, we’ll set up the hamper and get it delivered to you. This option ensures that your gift is truly one of a kind and you can also have certain products embroidered with the baby’s name. We’ll decorate your gift hamper with bows and ribbons and you’ll have the option of adding a special, personal message. Of the products you can choose from there are gift sets, baby basics such as bottles, linen and clothing, as well as soft toys. Our baby gifts are suitable for newborns as well as older babies, and the high quality of our products means that these gifts will never go out of style. We work on standard South African delivery which means it can take anywhere between 24 hours and 5 working days for your gift to be delivered. It is up to you to make sure that you have ordered your baby gifts well in advance. If you are ordering your baby hamper in Johannesburg, you can choose the option of porter delivery. And although we are based in South Africa, we do deliver our gifts internationally. When ordering baby gifts online, but you are not based in South Africa, please allow for 4 to 7 working days for delivery. When looking for gift ideas, we can help you make your selection. Browse through our website today and buy the best baby gifts online.